These snuggly hats look cute as well as being very practical, with their ear flaps and sheepy fleece lining, they keep little heads, necks and ears toasty in cold weather. The chin strap with adjustable Velcro fastening helps to keep the hat on, or it can be made without the strap. PUL is a waterproof fabric and if used as the outer layer it makes the hat rain proof. Polar fleece lining is also available for 50p less per size. 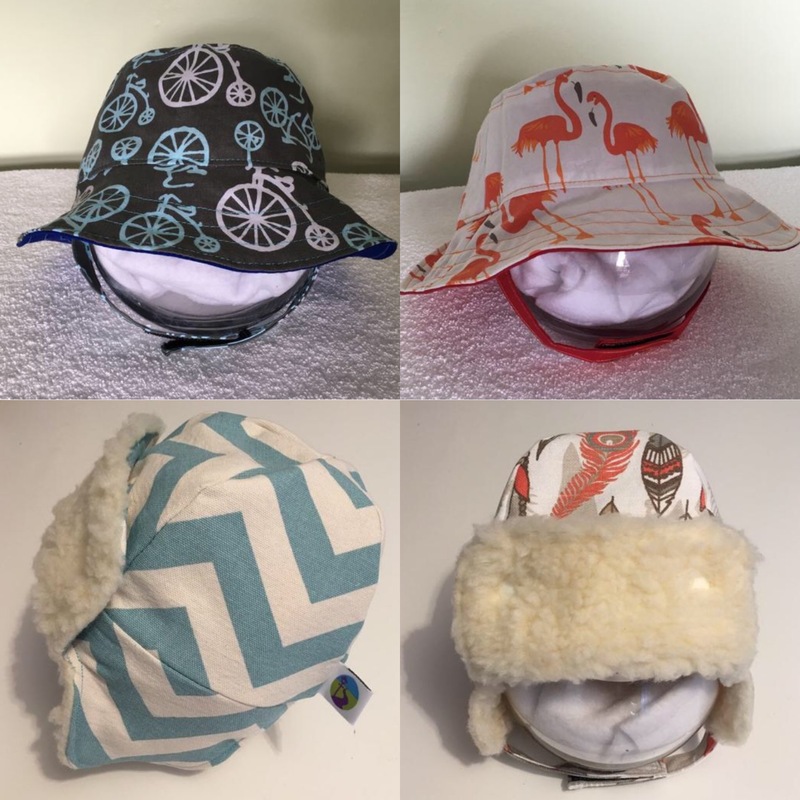 These fun hats look cute as well as being very practical, with their wide brim and cotton lining, they keep little heads cool and shaded from the sun. The chin strap with adjustable Velcro fastening helps to keep the hat on, or it can be made without the strap. PUL is a waterproof fabric and if used as the outer layer it makes the hat rain proof – because you never can tell what the weather will do in British summer time! 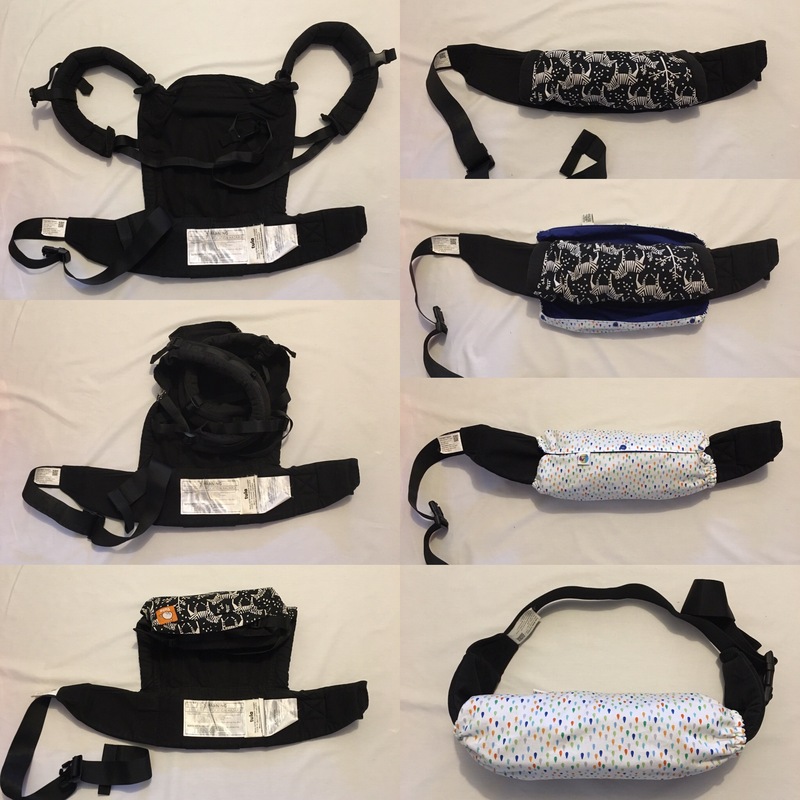 These are absorbent pads that snap around the straps of a carrier or wrap. They protect the carrier/wrap from dribble and chewing, meaning the sling itself needs washing less often and won’t get teeth marks. The top layer is made from cotton or wrap scrap, to match or coordinate with the carrier; the backing is a layer of plush or fleece (“stay dry” fabrics); and inside is a layer of terry or smooth cotton for extra absorbency. 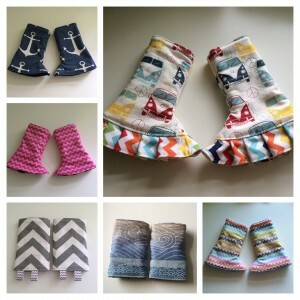 These pads can be made for various soft structured carriers (SSCs) including Tula, Integra, Ergo, Beco & more. I use fabrics from companies that have made available their certificates to show that there are no harmful substances in the dyes. Ribbons and frills are not standard but are available on request. These are designed to protect the sling when not in use, and make it easier to carry when it’s not doing the carrying. They come in various styles. 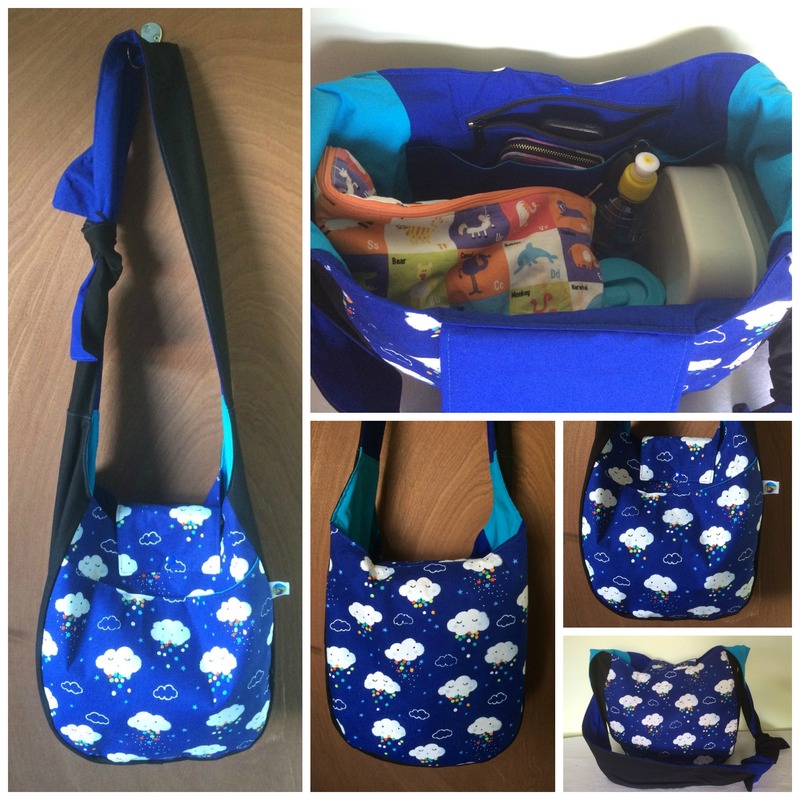 Not only does the bag hold plenty of items, it also features pockets to help keep everything organised so you can more easily find what you’re looking for when rooting around. There are two slip pockets (one internal and one external), and one zipped pocket (internal) for items such as a phone or keys. The strap is adjustable with a tie handle, meaning it can extend to approximately 47“ / 120cm when tied at its longest, and much shorter when tied down at the base of the straps. 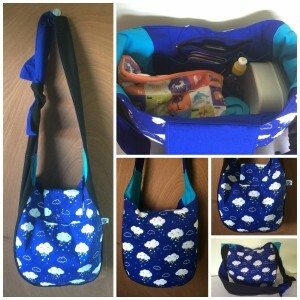 The bag has a flap to bring both sides together at the top, and this fastens with a KAM snap. The bag is made from 100% cotton fabrics: hardwearing canvas for the sides, base and straps; printed lighter weight cotton for the front and back panels; and plain lining cotton for the inside. 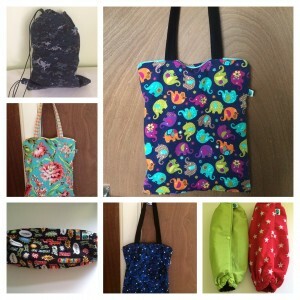 I can custom make bags like these using various colours and designs of cotton – please see here for in-stock cotton prints.